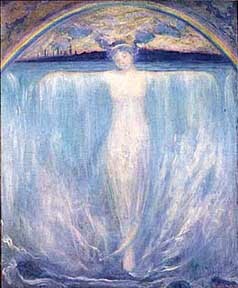 Evelyn Rumsey Cary was the artist who designed the Art Nouveau Pan-Am poster depicting an Indian princess at Niagara Falls (the original Maid of the Mist). She was the wife of of Dr. Charles Cary (married 1879) and aunt of sculptor Charles Cary Rumsey. 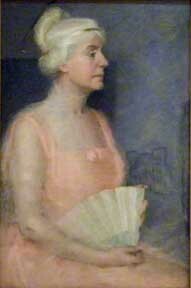 Evelyn Rumsey was the daughter of Bronson C. Rumsey of #330 Delaware. A women's. suffragist, artist, and patroness of the arts, she painted The Spirit of Niagara, official emblem of the Pan American Exposition in 1901, and the portrait of Charlotte Mulligan in the Twentieth Century Club, which Charlotte founded. Charles and Evelyn first resided at #210 Delaware (PHOTO), former home of Julius Movius, and 1867-1870 the first site of the Buffalo Club, a few doors north of Castle Cary. By the 1890s they were at #340 Delaware next to where Evelyn had been born and raised. Rumsey Award: Established through the generosity of Buffalo painter (and niece) Evelyn Rumsey Lord, the Rumsey Award is to be used for travel for artistic and personal enrichment or for tuition assistance for a summer studio art program outside UB. She is buriedwith her husband's family in Forest Lawn Cemetery in Section X, Lot 1. The Women's Building was the only "recycled" building on the Exposition Grounds. The land leased by the Rumsey family for the Exposition had partly been utilized by the Country Club of Buffalo for golf and polo grounds. That organization constructed its club house in 1889-90. The structure was turned over to the Board of Women Managers for use during the Exposition. It was a large wood-frame building with broad, shaded verandas on three sides located in the southwestern area of the Exposition grounds, outside of the Exposition plan. Surrounded by the gardens of the Horticulture exhibit, many found the area to be restful and beautiful compared to the grand scale of the Exposition buildings. When the Board of Women Managers took possession of the building, they asked one of their members, Evelyn Rumsey Cary, to provide interior decoration. The result was an assemby room capable of seating 125, offices, tea rooms, a reception space, and a "fainting room" among other spaces. There is a Woman's Building, but, sure! St. Patrick never swept the Emerald Isle as clean of snakes as the Pan-American Woman's Building is clear of exhibits. Now that the Exposition is open, the Women Managers have settled down to one role. They are entertaining, not exhibiting. Their building is in reality their club-house, and they do the honors therein. In being a club-house, it is true to its traditions. Before the Exposition it belonged to the Buffalo Country Club, and it still looks its original part. It was taken over by the Pan-American directors and given to the Women Managers to be used as their headquarters. As a club-house it is a success, and it has at least a touch of the all-pervading feminine which made the Chicago Woman's Building worth studying. 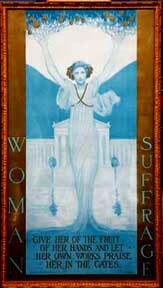 The whole house at Buffalo has been decorated and furnished by Mrs. Charles Cary, who also designed the Exposition poster, "The Spirit of Niagara." "Give Her Of The Fruit"
Women's Suffrage Poster Designed by Buffalo, New York native Evelyn Rumsey Carey in 1905, this poster supporting women's right to vote depicts an ethereal, almost celestial figure emerging from the earth like a tree, with her hands outstretched and her fingers intertwined with tree branches and ripe fruits. Behind her is an image of the White House [Capitol Building? Albright Art Gallery?] and written underneath are the words," Give her of the fruit of her hands and let her own works praise her in the gates." The poster was one of the most prominent visuals utilized in the women's suffrage movement.